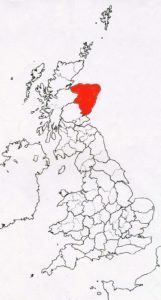 his area takes in the coastal counties, of Angus (officially Forfarshire, until 1928), Kincardine, Aberdeen, Banff, Moray and Nairn. 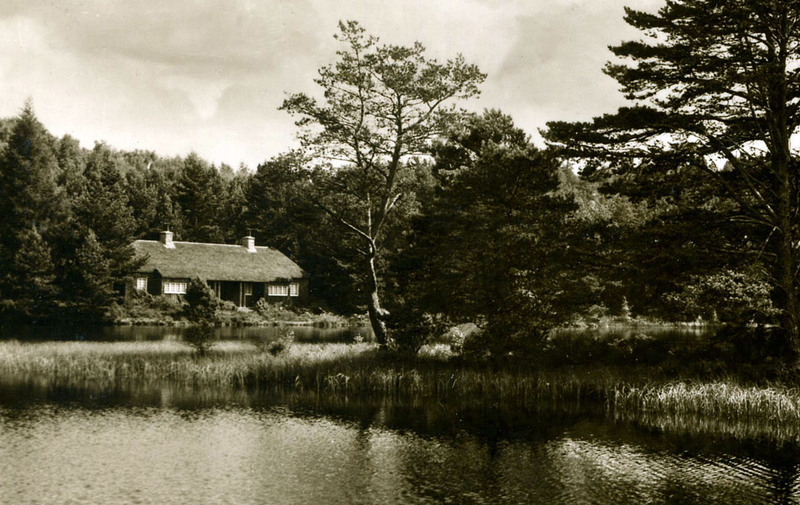 These counties were once the home to some unusual thatching techniques. But today there is little to show. 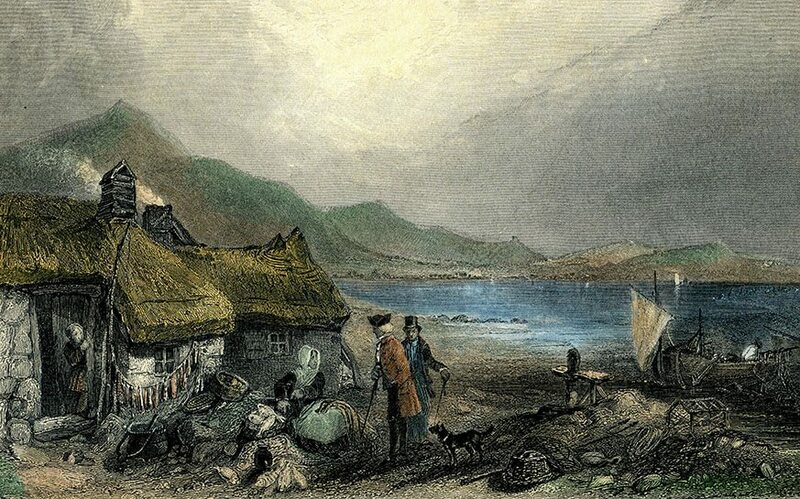 It was in this part of Scotland, that the eighteenth century improvements to the craft, really took hold; replacing the Highland tradition, with the Northern. Many of the changes in working methods, were noted by the Late Georgian Agricultural Reporters. 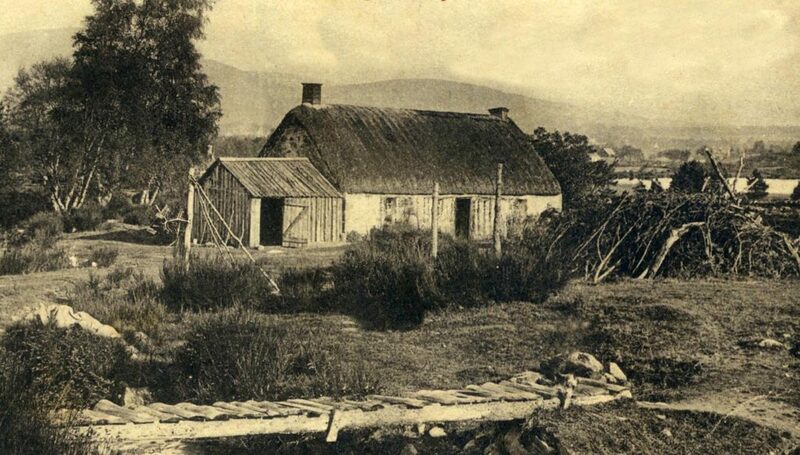 But in some areas, the original Highland thatching style often remained; long after they ceased their perambulations. 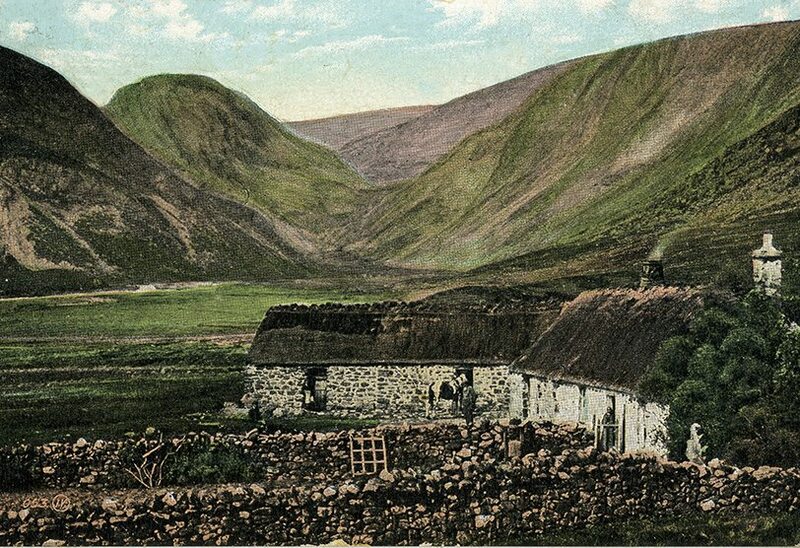 Highland, roped thatch was noted in Kincardineshire in 1813; but also work, with Northern turf ridges and gables, along with the stobbing method. Mr Leslie saw straw and bracken, both neatly roped in Moray and Nairn. His report of 1811, also mentions some improved thatching; using what became a local speciality… The use of clay or weak mortar, to fix standard courses of thatch in place. This is a known method throughout Britain; but now rarely used. Here they went one stage further and covered the whole roof with clay. 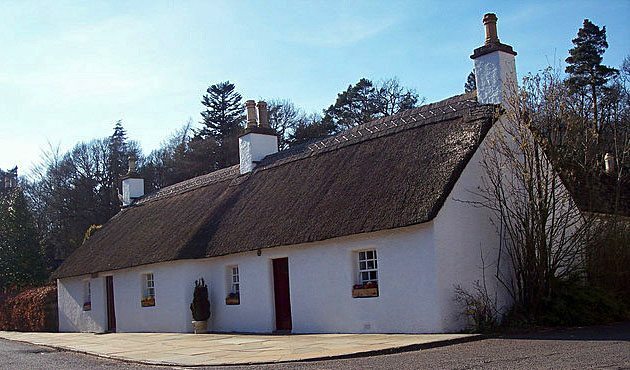 This was claimed to greatly extend, the thatch’s lifespan. An old thatch, under tin sheeting, examined near Huntley in Aberdeenshire; was done in this way; probably dating to before 1780. The eaves layer of oat straw, was tied on with straw ropes. Each course then had a layer of clay spread on top of it; for the succeeding course to bed down on. After two hundred years, this thatch was still very firmly fixed in place. The finished roof then had a watery mix poured over it; penetrating and sealing the coatwork. 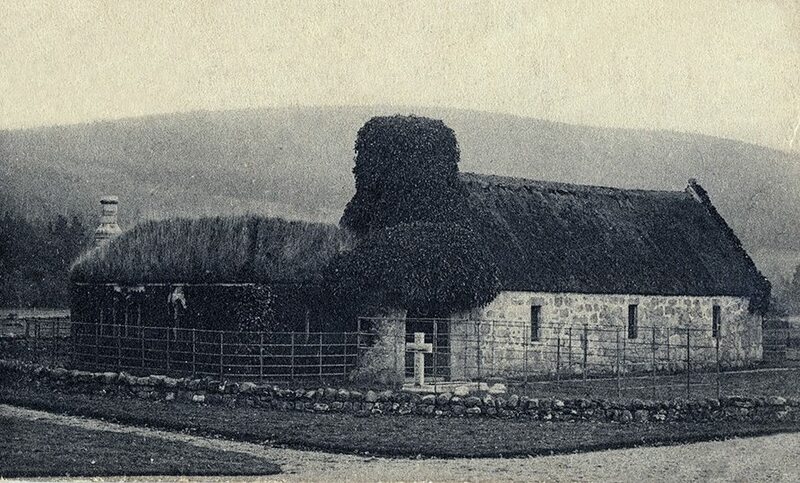 St Lesmo‘s Chapel, Glentana… Near Aboyne in Aberdeenshire. 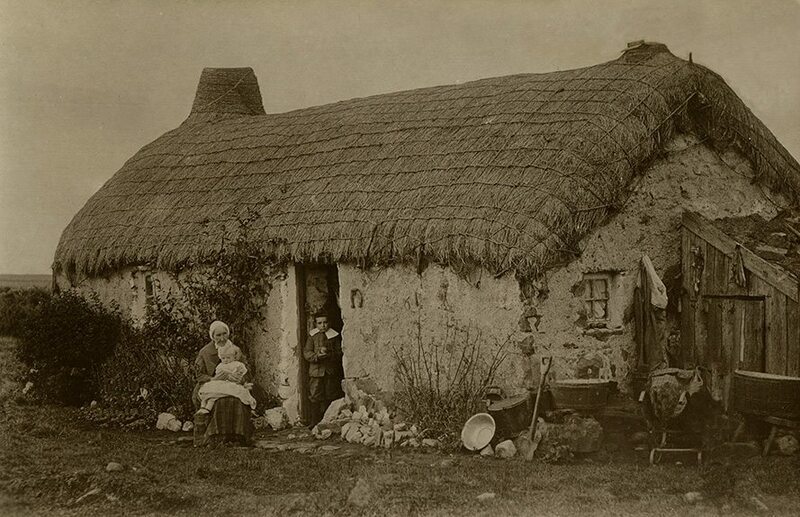 This Edwardian image, seems to show two thatching traditions. The main roof is a standard heather thatch, topped with turf. All very Northern. 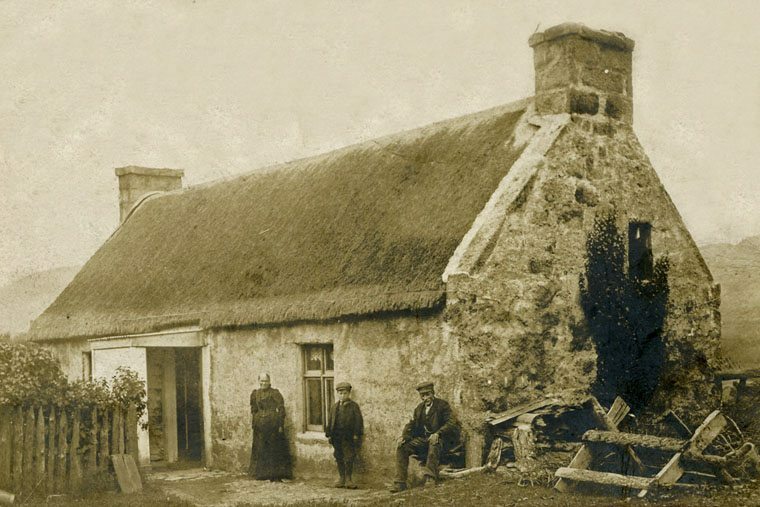 But the left hand, overgrown roof, has a thatch that does not extend over the wall and is probably the remains of some Highland thatching. Although looking ancient, this building was only a quarter of a century old, when this image was taken. The church still stands but slates now protect it. As noted above Stobbing also became a favoured working method; known locally as Tippeting. 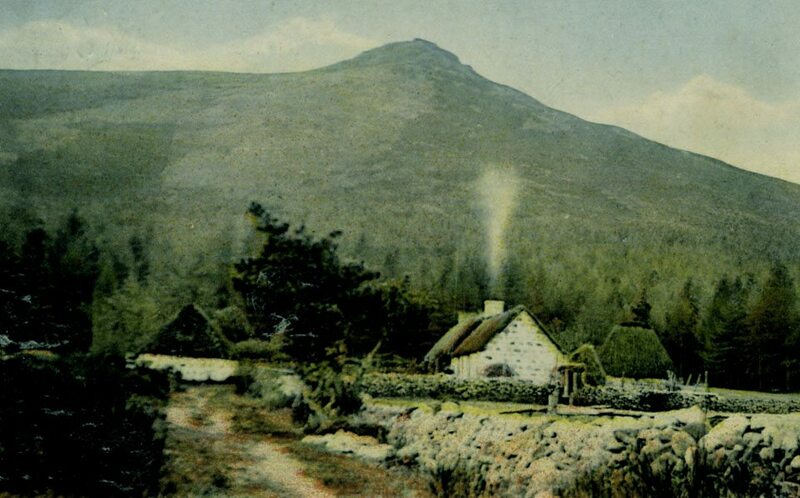 Many turf bases, of the original Highland roofs were often covered thus. Again, this type of thatching was often coated in clay. 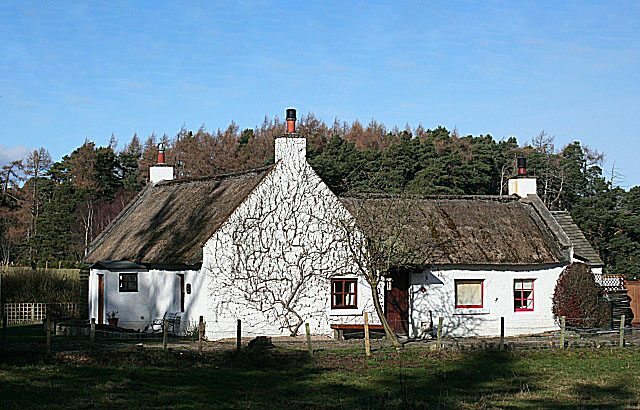 In 1811 Mr Keith reported how stobbed roofs had largely replaced the Highland tradition, in Aberdeenshire, in the pervious thirty years; but some cottages still retained their Highland roped roofs. 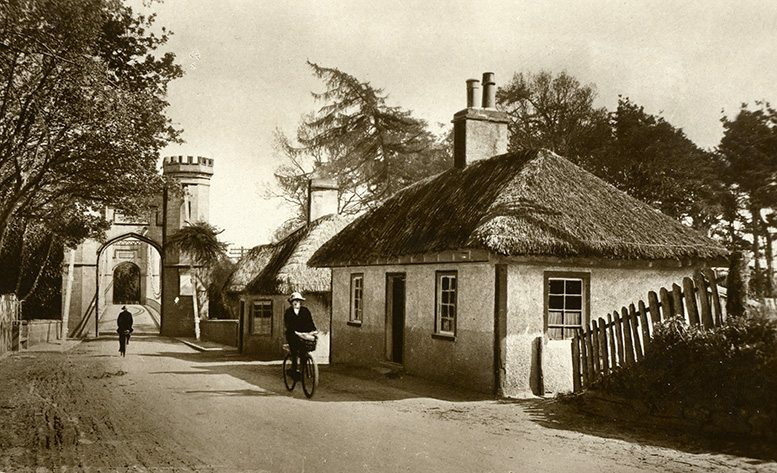 The above image shows a quiet road, in the 1920‘s… At Forres in Moray. These cottages are neatly repaired, with spars and liggers. The far roof having a fashionable ‘saw tooth’ block ridge. A type of ridging rarely seen in Scotland. The lower cottage has no such fripperies, as ornamental ridging; being ridged and coated with clay. The lighter areas are in fact snow. But this shows up, the cracked clay covering very well. 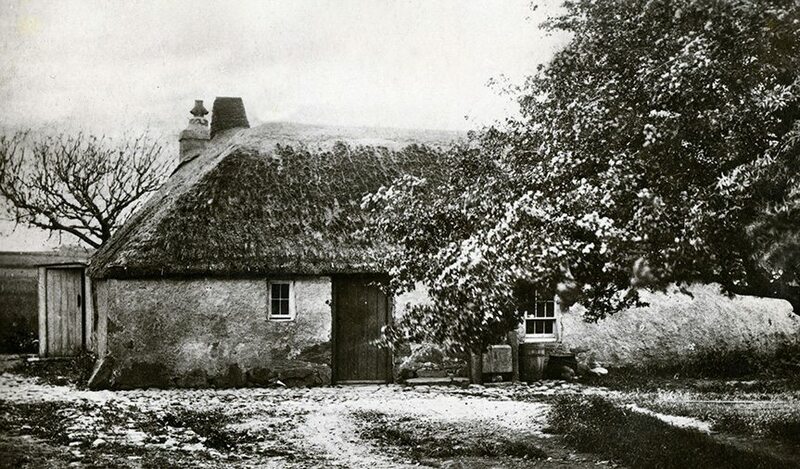 This Aberdeenshire home is at Linshart, just west of Peterhead. 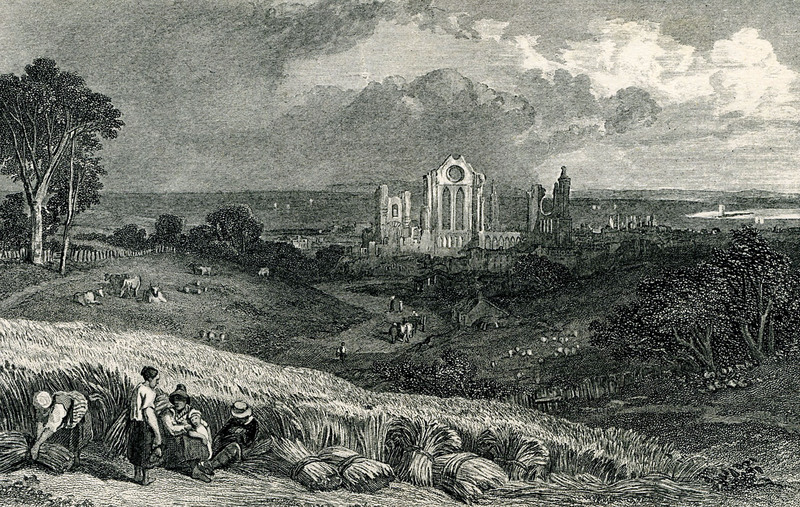 And was the home of the well known Scottish clergyman and author, John Skinner; vicar here for sixty five years. Dying in 1807; a century before this photo was taken. 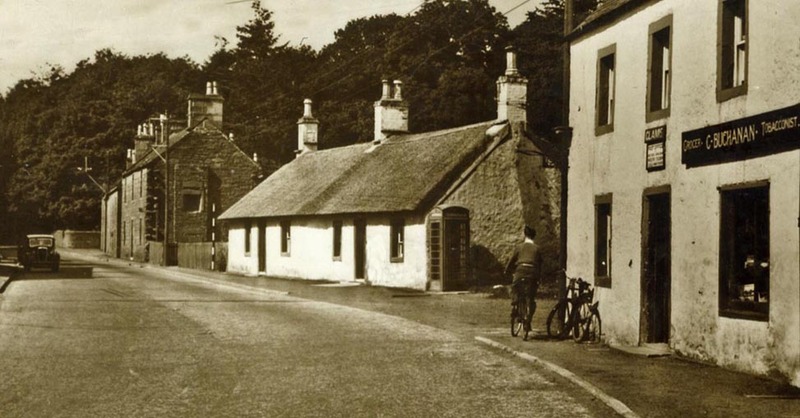 Below, left… ‘Thatched Cottages, Findhorn’. 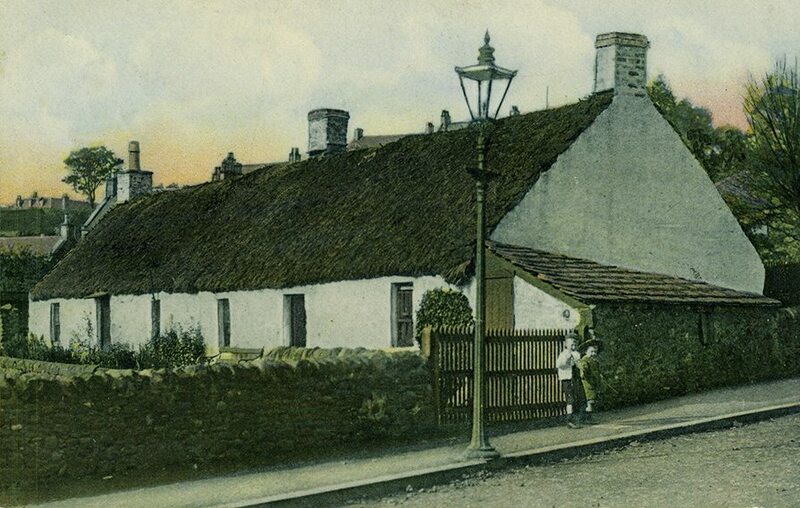 This post card was sent n 1951, the writer notes, ‘in many ways this is an old fashioned place with its thatched cottages still to be seen.’ Alas no longer the case. 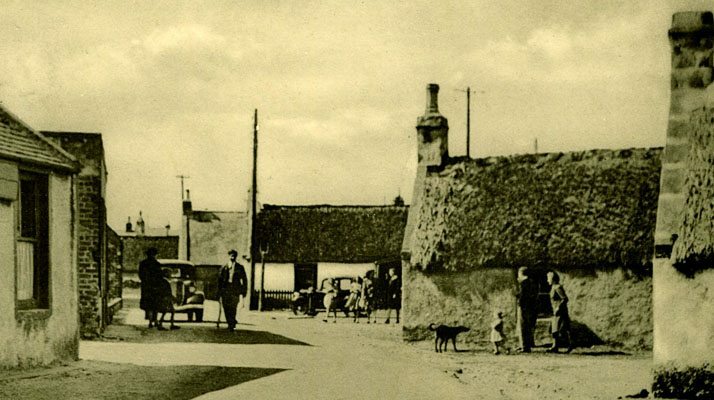 The card shows these Moray cottages coated in Tay water reeds, ridged with turf… The right hand photo is half a century older, depicting thatch at Bennachie, in central Aberdeenshire. This long distance view shows a very steep thatch, on the right, possibly a hay stack, topped with turf.